The next piece of DLC for Borderlands is set to arrive in a few short weeks for the Xbox 360 and PlayStation 3. Called Mad Moxxi’s Underdome Riot, the content introduces players to three new survival style arenas to co-op in. The content also adds a storage chest to the game, so you can keep those totally awesome scoped lightning shotguns of +50 explosive power in a safe place. Finally the content offers two bonus skill points to take your level 50 characters up to...well level 50 with two bonus skill points. It doesn't seem as fully featured as The Zombie Island of Dr. Ned, or rather, nearly as deep - but there should be some replayability here as well as a perfect method for loot whores to stock up. 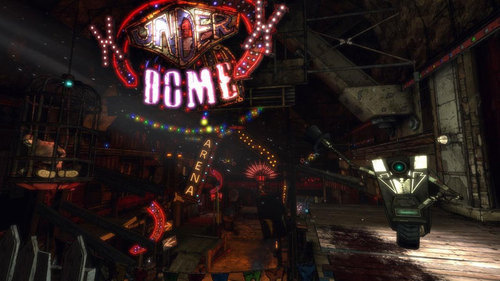 Mad Moxxi's Underdome Riot will cost 800 / $9.99 and be released on December 29th on the 360 and January 7th on the PlayStation 3. Thanks to Deriaz for the tip! Page created in 0.8953 seconds.